I think the title of this blog post just about sums up the day. The mornings in Goa here have been always sunny. No trace of clouds. But slowly or in an instant, depending on the mood, the tide turns, and the clouds gather. In an instant, you can go = from scorching sun to a downpour. 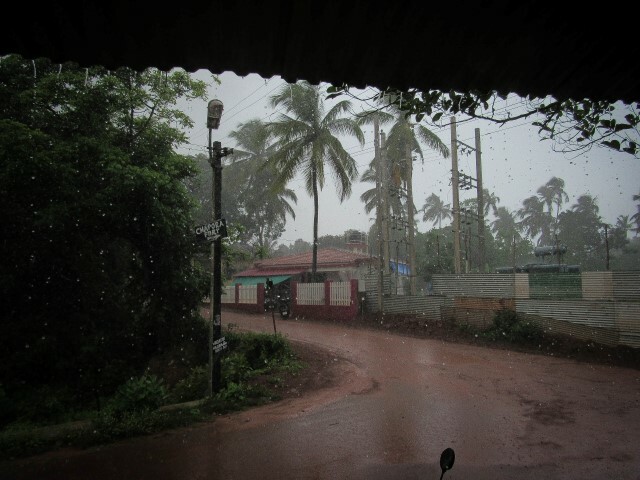 The first of these downpours catches me on my way to Chapora Fort. If you are a Bollywood movie fan, which I am not, then you would know that Chapora Fort is where parts of the Hindi cult movie, Dil Chahta Hai, was filmed. Wikipedia tells me rather confusingly that there was another fort before Chapora when the Portuguese conquered Bardez in 1510. 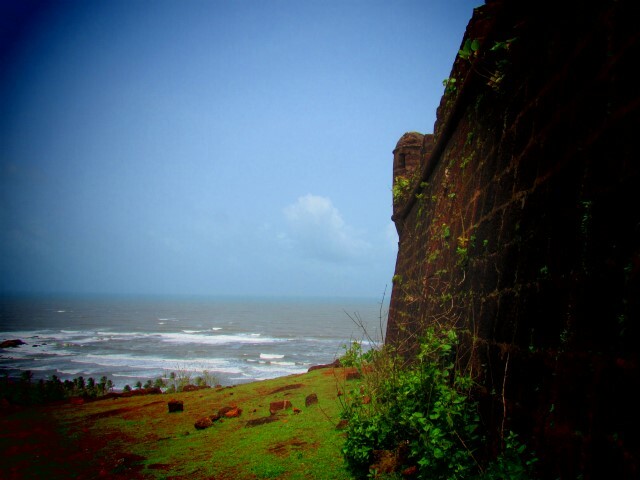 But despite the confusion, the fort is over five centuries old. The ramparts of the fort are crumbling and I am struck by the lack of anything to designate this as a historical spot of some significance. 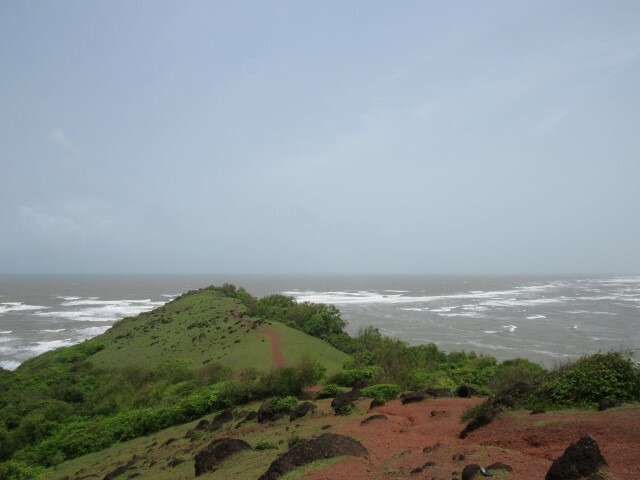 From the location, you can understand though why the Portuguese and the Marathas fought for it. I would too, with such a view. 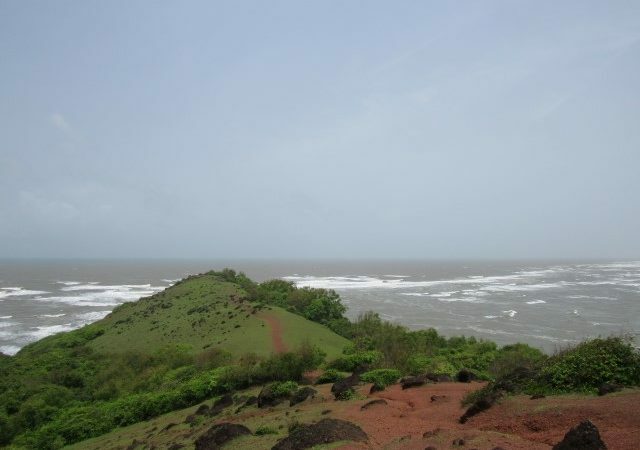 The Arabian Sea is spread out in majestic splendor on one side. The greenish tinged Chapora river is stretched out on the other side. The fort is just a passive spectator to such beauty. What looks like a dragon’s back, clad in green, stretches out from one side of the fort. 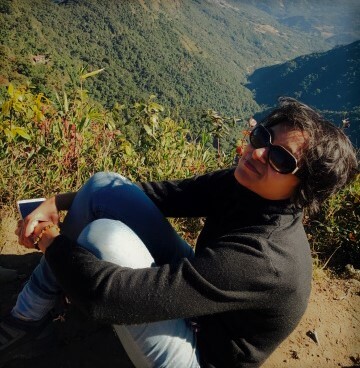 I think of scrambling down for an instantaneous Chapora trek, but the gravel is too slippery. When you travel solo, the risks you take tend to simplify themselves. Either you do it safely or you don’t at all because there is no one watching your back for you. So, I stand there on the dragon’s back, shade my eyes from the sun, and watch below as the sea cares not about sun or rain. Chapora is a picturesque location and deserves prominence not just because of its borrowed fame from a Hindi movie. It saddened me that there was nothing there give the visitor a sense of historical perspective. I wanted to close my eyes and imagine marauding invaders from across the sea. Booming canyons. Warring guns. But there is not even a plaque that tells me anything about the fort. Its crumbling history is a taut reminder of how we in India take our past so lightly. In Chicago, I was astonished to see houses labeled as heritage when they were just 50 years old. Here, we have a 500-year-old fort and no one calls it heritage. It’s a dilapidated wall that has already been defaced by eternity seekers. Climbing down from Chapora, the sun makes one last appearance before closing shop for the rest of the day. It’s rain. Pause. Rain. Pause. I take shelter under the awnings of a café shut for the monsoon as another downpour hits me. A family that was also on a bike joins me. A man in his thirties is holding a baby strapped to his waist. His wife is riding the bike. Behind him is what I assume would be the father and mother of either one of them. The mother is fashionably dressed. Dapper in sleeveless long flowing caftan-like top and shorts. The father, bald, but still carrying a hint of what must have been a fairly handsome youth. They intrigue me. Indian families touring on a bike? I have seen the usual college and ‘techies’ gang. But this is a first. I couldn’t understand their language either. My investigative skills being fairly limited, I watch them openly even as they ignore me openly. There is some talk of hiring a car versus renting a bike and the choice having petered down to cost. The fashionable mother barely glances at the baby, her grandchild, which is again a first to me. Indian grandparents I have known tend to fairly smother the baby in a frantic expression of disappearing parenthood. Here, they looked like they couldn’t care less. The young man’s wife coos over the baby, talking the usual gibberish that we think for some reason is what babies understand. The rain abates. They move away. I do too, the roads washed afresh. The rain returns with a smile five minutes later. And doesn’t let go for the rest of the day. It’s still beautiful.